Today at the FedGIS conference in Washington, DC, the US Department of Homeland Security announced that Homeland Security Infrastructure Program (HSIP) is now HIFLD Open. In 2001, the United States was attacked in a coordinated effort at multiple locations which had devastating impact across the country. We had direct insight into how little we knew about our national infrastructure and assets that are necessary to both protect from attack and leverage in response. One actionable response was the US Department of Homeland Security (DHS) and National Geospatial Intelligence Agency (NGA) collaborating to develop the Homeland Security Infrastructure Program, HSIP. 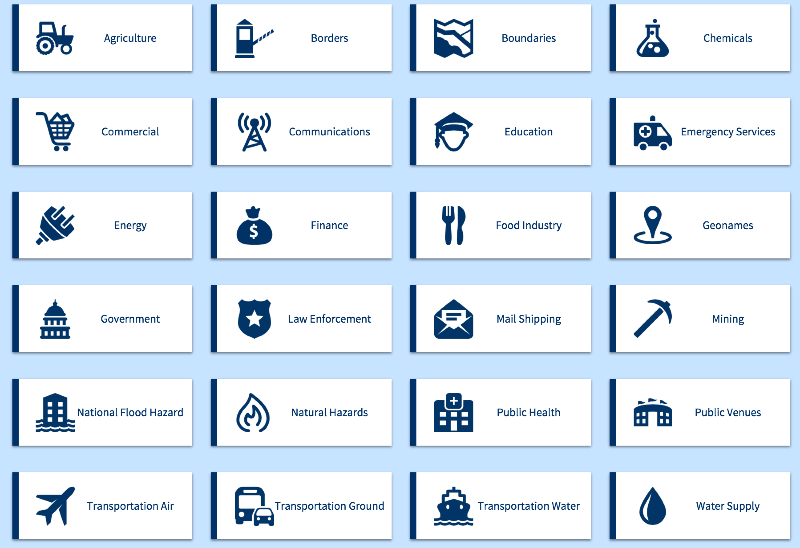 For the safety of the nation, federal agencies connected and aggregated data from hundreds of regional and local data providers to compile over 500 national geospatial data assets that provide a complete picture to our roads, water systems, schools, communities, facilities and more. The result was the Homeland Infrastructure Foundation-Level Data Working Group, known as HIFLD. For the past 15 years, HIFLD has successfully managed the data aggregation, curation, and dissemination of these data through computer discs. Access has been restricted to FOUO – For Official Use Only; effectively limiting the access and reuse of these data to pre-approved agency members. The DHS mission takes an “All Threats, All Hazards” approach. But Homeland Security is more than just physical or emergency management. It needs to also address the economic security as well as non-traditional, invisible threats if we are to truly be a resilient nation. They saw a need to empower every citizen to have an active role in our security. It was necessary to radically shift from yearly, physical media to realtime, on-demand and dynamic data available everywhere, by everyone. 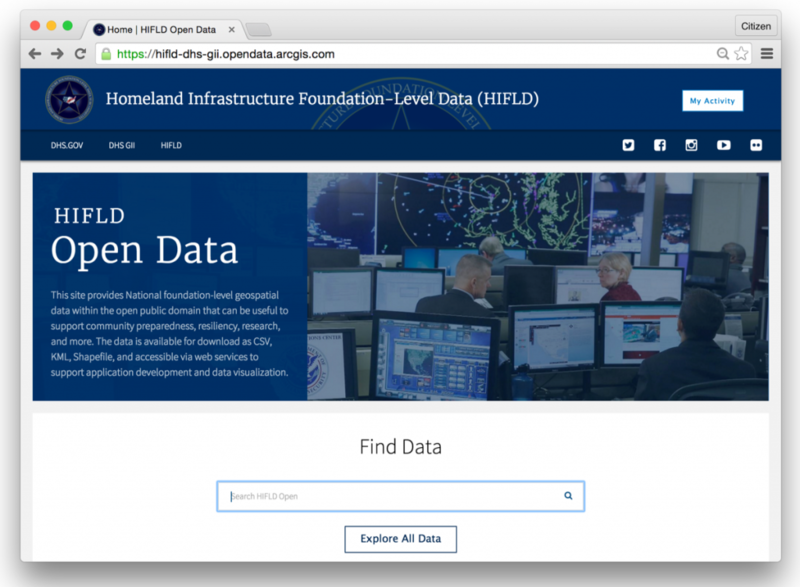 Available today, HIFLD Open – public access to over 250 datasets as dynamic web services as well as up-to-date downloadable files and visualization tools for users to explore and use these data assets. Data such as Alternative Fueling Stations can help local governments evaluate transit infrastructure investments as well as fuel availability during a disaster event; shipping infrastructure indicates opportunities for new businesses that need access to goods transportation; and unique data like public refridgerated warehouses is important if there is a need to keep vital materials cold. ArcGIS provides a hosted infrastructure for DHS that provides not only data as web services, but visualization and analytical capabilities to local governments and communities. Using ArcGIS as their Data Platform of choice, DHS was able to curate and publish these data across multiple thematic groups and have an easy user experience that makes these data discoverable and explorable by anyone. National security requires a Whole of Nation approach, HIFLD Open marks the beginning of a new era that requires participation by everyone. We have an opportunity to be an Open Society, from citizen neighborhood watch, to city law enforcement, state agencies, businesses, and community groups. This large step into the Open by the DHS is also setting a precedent to other governments across the Federal, State, and Local levels to also make more data freely accessible.